(OPride) ― Ethiopia says hundreds of Oromos killed and hundreds of thousands of civilians displaced from their homes in still ongoing violent clashes in the Eastern part of the country. Locals in Oromia have complained for months about cross-border attacks and killings by the Liyu police. Yet, its attacks on civilians and expansionist raids have gone largely unreported, including a recent grenade attack at an elementary school in Miesso and the massacre of several dozen civilians in the town of Chinaksan. Civilians have been displaced on both sides due to the renewed conflict. 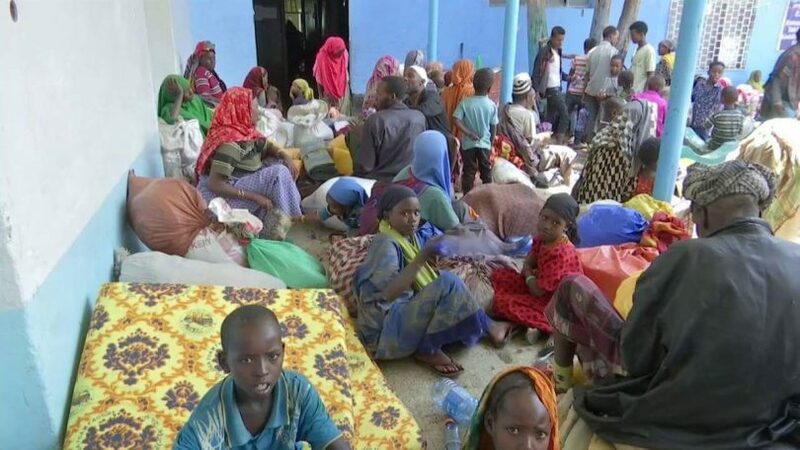 Thousands of Oromo residents and merchants fleeing Jijiga, the capital of Somali state, have taken refuge at a makeshift shelter in the city of Harar. Last week, the central government announced plans to deploy federal police and military forces to quell the fighting. After its deadly clamp down on peaceful protests in 2016, which ended with the declaration last October of a nationwide state of emergency, the deployment of federal forces isn’t necessarily reassuring or a source of relief for the locals. 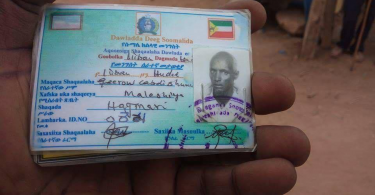 In fact, activists and those affected by the crisis say the Liyu police is killing Oromos at the behest of the powers-that-be in Addis Ababa, Ethiopia’s capital. One thing is certain: Ethiopia is due for yet another horrific stint of bloodshed before things eventually subside. That is because our political leaders continue to refuse shouldering any blame and there remain no platforms for sober-minded individuals to prevail and appeal for calm. 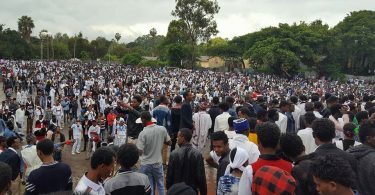 On the heels of the tragic events of 2016, which saw so much bloodshed, pain and heartbreak due to state sanctioned violence against unarmed protesters, armed showdowns along the Somali-Oromia border and the return of armed forces to the streets point to an extremely worrisome development for Ethiopia and the region as a whole. Media coverage of the latest conflict has been dismal. But the displacement of nearly half a million civilians since 2016, according to Oromia state officials, marks the largest internal displacement of people since the 1998-2000 Badme war with Eritrea. Years of systematic crackdown on freedom of expression has emaciated the local press and civil society organizations, leaving state-run outlets to fill the vacuum with official propaganda. As a result, facts and figures remain highly contested. The lack of independent and credible reporting on the causes of the latest bouts of armed hostilities continues to exacerbate tensions. The conflict between Oromia and Somali states isn’t a result of competition over increasingly scarce natural resources such as water and grazing land. This much is clear: The conflict between Oromia and Somali states isn’t a result of competition over increasingly scarce natural resources such as water and grazing land. It is also not fueled by policy disagreements and broken promises. 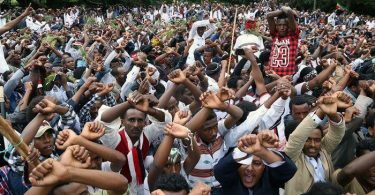 It isn’t a precursor to an all-out civil war either or the beginning of the end for Ethiopia’s ethnic based federalism. To say so is an extreme oversimplification of it. To fully grasp the genesis of the current conflict, one must go back a decade. In 2007, Ethiopia launched a full-scale invasion in Somalia as part of the broader U.S. “war on terrorism.” Meanwhile, the Ogaden National Liberation Front (ONLF), a rebel group fighting for the secession of the Somali regional state from Ethiopia, decided to up the ante at home. Founded in 1984, ONLF was part of the Transitional Government in Ethiopia in the early 1990s, even participating in the political process, including running for parliamentary seats in the region. But after a bitter fallout in the 1995 elections, the ONLF complained of systematic oppression and returned to armed struggle. Outlawed and pushed out of the political process, the ONLF languished, with its members dispersing and its offices closed. Throughout the 90s and early 2000s, the ONLF’s relevance decreased. Reports of guerrilla style hit and run attacks by the ONLF were few and far between. But, in 2007, a revamping of their efforts and newly begotten support and funding emboldened the group. Eritrea and Egypt were allegedly involved in the training and arming of the group, which decided to flex its muscles with attacks on police stations and military installations in the region. The Ethiopian military, engaged in a full-on offensive in Somalia, was caught off guard when ONLF attacked an oil extraction site in the town of Abole. On April 27, 2007, heavily armed ONLF fighters raided the Sinopec oil field and massacred those present, leaving 65 Ethiopians and 7 Chinese nationals dead. The manner and scale of the attack came as a shock and marked a significant departure from the ONLF’s previous operations. Soon after, the Ethiopian army launched a massive counterinsurgency campaign in the Somali regional state with the goal of wiping out the ONLF. After the Abole massacre, the targeting of foreign nationals sparked international media interest in the Somali region. The ONLF relished in the heightened media interest in its aims and activities. The Ethiopian government saw this as a national embarrassment. In particular, the appearance of gun-toting ONLF rebels on Al Jazeera undercut the government’s carefully crafted image of the country as an investor’s paradise. 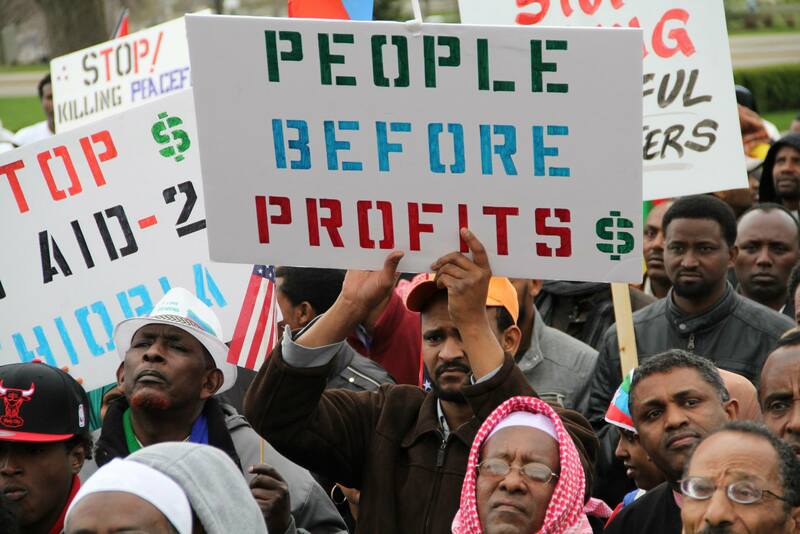 They sought to put an end to the media frenzy surrounding the ONLF. As the military operation to crush the ONLF commenced, Ethiopia put the Somali region under a media blockade. As part of the crackdown, in May 2007, three New York Times journalists were detained, their cameras, laptops, cellphones and other equipment was confiscated. The reporters were released five days later and expelled from the country. The region also became off-limits for international aid organisations. Red Cross and Medecins Sans Frontieres were subsequently expelled from the region for allegedly siding with or aiding the ONLF rebels. This was followed by reports of extrajudicial killings and rampant human rights abuses. Scores were killed in the operation. The Ethiopian army did not fully dislodge the ONLF but it severely reduced the group’s operational capacity. Although the government declared the end of the military operation in 2008, the region remains under media blockade to date. Abdi Mohamoud Omar was a junior security officer at the time. 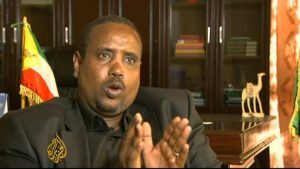 But his role in quelling of the ONLF insurgency earned him the trust of the top military brass and intelligence officials. Abdi Omar (better known as Abdi Illey) was a man they could count on to keep the region in check. In 2008, he oversaw the formation of the state’s paramilitary force, the Liyu police. Since 2008, the Liyu police have filled the void left by departing national forces and have administered the region with an iron grip. There have been very few reports of ONLF activity, but the Liyu police has been accused of massacres, kidnappings, and torture of dissidents and political opponents. In 2010, despite his lack of an educational background and political experience, Abdi Illey was rewarded with the presidency of the Somali region. Abdi Illey continued to oversee the Liyu Police’s operations. Accusations of extrajudicial killings and torture also continued. A 2013 Human Rights Watch report indicated that in March of 2012, Liyu Police forces massacred 19 people in two days. Meanwhile, it appears that the central government gave him carte blanche to do whatever he wanted in the region. As a result, Abdi Illey has not only clamped down on opponents, but the Liyu police have made repeated incursions well beyond their jurisdiction into neighbouring Oromia. Despite widespread reports of abuses, in 2013, the British government sponsored the Liyu police to a tune of 15 million pounds over the course of five years. The agreement was part of UK’s efforts to combat terrorism and the training and arming of the militia was sold to London as a key part of promoting peace in the region and combatting terrorism. UK’s involvement in the funding of Abdi Illey’s Somali state police underscores two things. 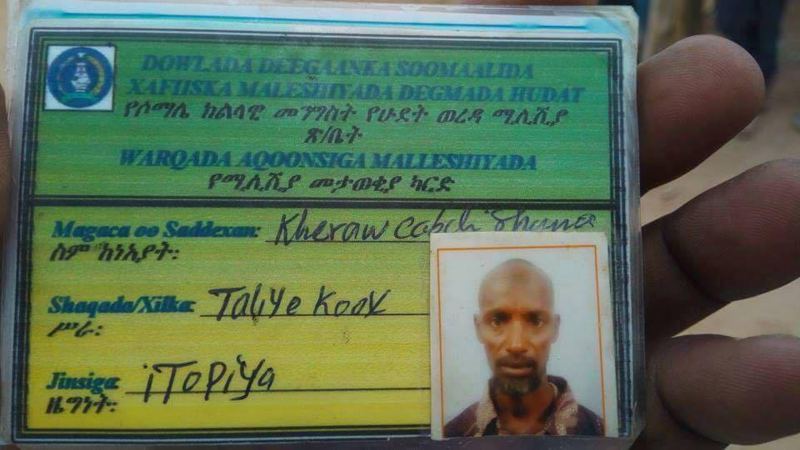 First, it shows just how much the powers that be in Addis Ababa value Abdi Illey. Second, it could also reveal that the Liyu police have a mandate that includes pursuing terrorists in neighboring Somalia. There is no evidence of this but it’s difficult to believe that UK would fork over millions of pounds in pursuit of the ONLF, a ragtag group of rebels that by 2012 had been diminished as a fighting force and that is not designated as a terrorist group by the British government. In fact, the Brits don’t view the ONLF with the same spectacles as the Ethiopian government. The ONLF has held public meetings in London. They had a delegation at a London conference in 2011. In 2014, a ONLF leader was called to give a speech in London where he openly spoke of the struggles his organization was facing. The British government isn’t known to have taken any action to disrupt ONLF meetings and fundraisers, so why would it invest heavily on exterminating the remnants of their armed wing 10,000 kilometers away in East Africa? The only armed group in sub-Saharan Africa that UK proscribes as a terrorist group is Al-Shabab. Could it be that UK officials were misled into believing that Abdi Illey’s forces would fight Al-Shabab in Somalia? And could this possibly be an indicator of the Liyu police’s direct involvement in combat in Somalia? A 2015 United Nations Security Monitoring Report noted that the Liyu police’s abuses have even crossed international borders. The group reportedly had nearly 5000 operatives in Somalia’s Bay and Bakool regions and having carried out killings of civilians in July of 2015. UK is less likely to sponsor a rogue armed group tasked with breaking international law and defiling the sovereignty of another country. But, with a prior presence in Somalia, a contingent of Liyu police running rampant in Somalia could easily be portrayed as an Ethiopian troop surge, or a unit of special operatives, similar to the American Navy Seals. Regardless, if the Ethiopian government had no qualms about a provincial security force defiling Somalia’s sovereignty, no wonder there have been little to no repercussions for the Liyu police’s unprovoked incursions into Oromia. Oromo farmers report the Liyu police is routinely deployed to settle even minor pastoral disputes between Somali and Oromos along the common border. A similar police unit in Oromia was disbanded in early 2000s, leaving locals and poorly armed militias to defend Oromia’s territorial integrity against heavily armed paramilitary force. As a result, the Liyu police faces little to no opposition in its cross-border raids, aggressive expansions and abuses inside Oromia state. In March, Addis Standard reported that up to 100 people were killed across Oromia in February 2017 alone. Somali state forces killed 30 people killed on February 22 in Bordode town of Oromia, a local eyewitness told the newspaper. A spokesperson for Oromia state, Addisu Arega, described the assailants as “armed militiamen coming from the Somali regional state.” Addisu added that the aim of the invading force was territorial expansion into areas long demarcated as parts of Oromia. “There are [instances where] after crossing over to these areas, the armed militiamen engage in acts of hoisting the Ethiopian Somali regional state flag claiming the areas to be part of the…state,” he said. The border issue was settled in an October 2004 referendum when 80 percent of residents in the disputed areas voted to remain part of the Oromia state. However, the process of demarcating the land as per the results of the referendum was put on hold for many years. Addis Ababa’s stalling of the process enabled politicians in Jijiga to seek the undoing of the democratic process. For over a decade, the results of the referendum remained only on paper, bearing little or no authority on the ground. 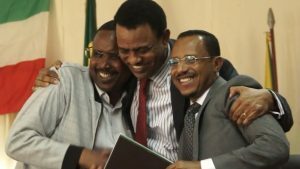 Last April, state media reported that Oromia and Somali officials had agreed to fully abide by and enforce the results of the 2004 referendum. The deal was inked with much fanfare amid smiles, hugs and handshakes. But it took only five months for the violence to return. In an unprecedented development, the two sides are now accusing each other of killing civilians and lying to the media. Meanwhile, until last week, the federal government has done or said little about the crisis. A question must be asked: Why? First, consider why the government in Ethiopia did not demarcate the Oromia-Somali border as per the results of the 2004 referendum. The answer is simple: The Somali state security apparatus has been a solid, reliable partner of the powerful Tigrayan People’s Liberation Front (TPLF) leaders. Abdi Illey and his entourage have successfully tamed ONLF rebels, who once thrived in the porous vast desert of Ethiopia’s Somali region. Since time immemorial, the vast Ogaden desert has been home to insurgencies and outlaws. Fascist Italy invaded Ethiopia from two corridors, one being via the contested Somali region in 1935. Forty years later, Somalia created the Western Somalia Liberation Front (WSLF) which ran rampant in the same region, harassing the Ethiopian army, sabotaging equipment and attacking military bases. Somalia later launched an all-out invasion of Ethiopia, known as the Ogaden war of 1977-78. As such, security in this region has always been a problem child for Ethiopia’s rulers. That is what Abdi Illey provides: Security. He has risen through the ranks to provide the central government with the control of the region. 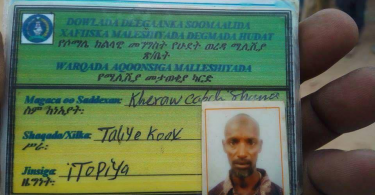 In the decade since Abdi Illey was accorded permission to implement his hands on approach to security in the region, ONLF activity have died down. Memories of the group’s Abole massacre no longer haunt. Foreign oil companies are in abundance across the region, pursuing oil extraction projects. In 2013, Jijiga was deemed secure enough to host the 18th annual Ethiopian Nations and Nationalities Day festival, which saw hundreds of thousands converge on the state for highly choreographed weeklong celebrations. Meanwhile, since Abdi Illey was named Somali state President in 2010, Oromia has seen four different presidents. Seen as puppets of TPLF leaders, the leadership of the Oromo People’s Democratic Organization (OPDO) have often been the target of severe criticism by the Oromo population. In other words, the weakness and divisions within the OPDO stood in sharp contrast with the Somali state, where Abdi Illey and the Liyu police are the law of the land. As such, TPLF likely cast aside implementation of the 2004 referendum as a reward for the Somali region’s stability, security, as well as the unquestioned loyalty offered by the strongman in Jijiga. Perhaps the most frightening aspect of the current conflict is the fact that it is hard to put a finger on the extent of the cooperation between Abdi Illey and the security elite of the federal government. 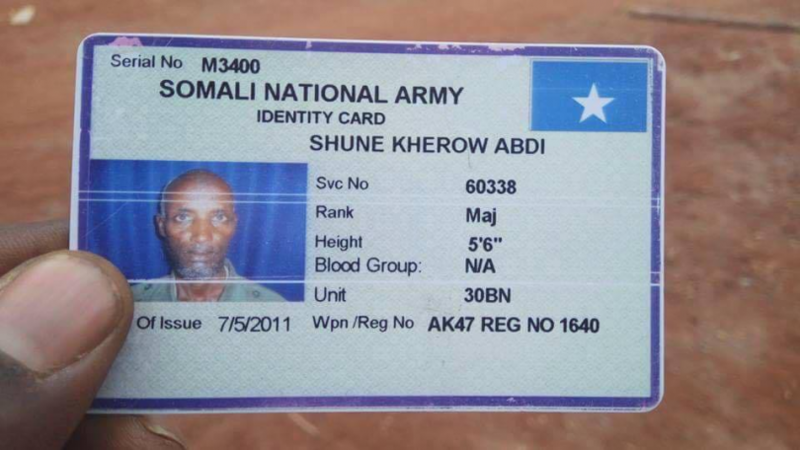 Earlier this month, social media was abuzz with images of identity cards belonging to a man named Shune Kherow Abdi, who was reportedly caught while fighting alongside the Liyu police. 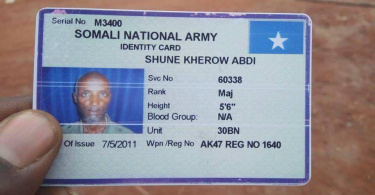 The documents include a militia membership card issued by the Somali regional state and a Somalia national army card issued in 2011. At first glance, this is evidence of members of Somalia’s army fighting as mercenaries for the Liyu police. 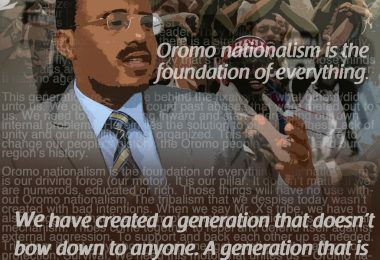 Many a Oromo activist has claimed the same. 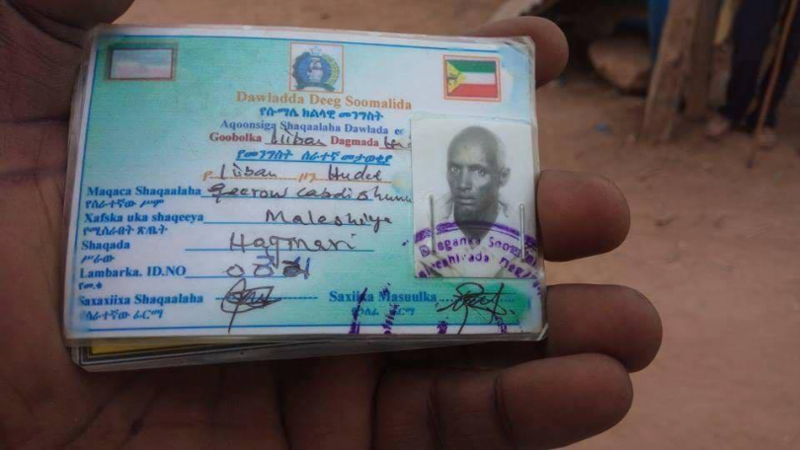 However, there is no way to authenticate the images and the Somali embassy in Addis Ababa denied the identity card was issued by its army. While there is no way of determining the extent of the on the ground cooperation between federal forces and the Somali state Liyu Police, it’s evidently clear that armed men under the command of Abdi Illey have seen their crimes go unpunished for years. Addis Ababa’s reluctance to investigate the Liyu police abuses has granted them immunity from prosecution or reprimanding. By contrast, the unidentified and unaffiliated assailants, who carried out the killings of ethnic Somalis in Awaday, were immediately branded as “terrorists” and condemned in official communiques. To be clear, the massacre of Somali merchants in Awaday was a callous and cowardly act that deserves condemnation. The perpetrators deserve to be brought to justice. However, when killings of unarmed Oromo farmers by state-sponsored paramilitary forces brings about no such condemnation, the prejudice becomes extremely obvious. It also explains the people’s lack of confidence in the federal government’s impartiality in the conflict. The two states’ officials continue to ratchet up war of words. For example, Somali lawmakers have accused Oromia State President Lamma Magarsa of being the mastermind of the killings in Awaday. A press communique even called for his resignation. Oromia insists that the Liyu police instigated the conflict and locals were outraged over the murder of a former Oromo lawmaker by the group. The federal government has since deployed troops to all the contested areas. Hundreds of thousands of Oromos and Somalis remain in IDP camps. A number of countries have issued travel advisories warning their citizens against nonessential travel in the region. The two state leaders, Abdi Illey and Lamma have since held press conferences calling for calm and expressing sadness for the unfortunate events of the past month. The worst appears to have blown over. But the core issue remains unsolved. Once again, the Liyu police is poised to get away with murder, torture and intimidation. Addis Ababa has once again looked away despite an overwhelming evidence of the unit’s egregious abuses. There is no indication that this will change any time soon. Oromia does not have a state-sanctioned and fully armed self-defense force to protect its border and people from future Liyu police raids. Locals farmers, who pick up arms and fight to protect their families and land, are pursued by the full force of the law. Sadly, hundreds of thousands of Oromo and Somali masses have been uprooted from their homes and their livelihoods destroyed. The two brotherly people, who lived side-by-side for all of recorded history, are now caught in a turbulent storm caused by an elitist thirst for land and power. One of the central roles of a government, any government, is to ensure the protection of its people. But, in this case, the regime in Addis Ababa created the monster that has wreaked havoc along the border with Oromia for nearly a decade. By turning a blind eye to repeated violations and reports of atrocities committed by Liyu police, the government in Addis Ababa is directly responsible for the escalation of tensions and loss of lives. Allowing a shadowy army to operate unchecked in a region blockaded from independent media, aid groups and observers was always going to be a recipe for disaster. The ticking time bomb has exploded and its shrapnel is tearing into the Somali and Oromo people of Ethiopia. Ethiopia’s security and military elite brought Abdi Illey into his position of power. It is up to them to tame and set him straight. The only question is: Will they? Or why should they? As an Ogadeni Somali, I agree with you 100%.There is no enmity between the Oromo Peopple and Somalis.These 2 ethnic groups are so close in every respect that they could be classified as one peopple.We know the elephant in the room, and that is the Highlanders, be it Tigrees or Amharas, who have made thier buisness in opprrssing us. 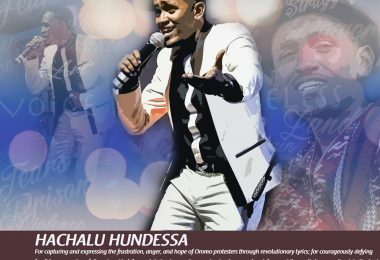 All I can say is: shame on us–Oromos and Somalis–if we fall for this.Abdi Iley,well he sold his soul to the Devil, and we all know where at the end Satan will lead him to:Hell.